When you were little, you probably rocked barrettes, bows, beads, or “bo-bos” in your hair at least once. Then somewhere along the way, you decided you were too old for that stuff. NEWSFLASH! You’re never too old for a hot hair accessory! It’s just a matter of upgrading from barrettes to jewelry. Let’s look at some fabulous options that can really set off a fresh hairstyle. Beads- Beads are still a viable option in adulthood. Just try for a wooden or metal look as opposed to the classic plastic pony bead. Hair combs- These don’t just help with styling, they can be fashionable too. There are some great bejeweled and floral options. You can even find sets connected with beautiful chains for an upscale style. Head chains- These are popular for wedding styles and other formal occasions, but we see no reason not to rock a crown daily. Go ahead and accessorize your inner queen! 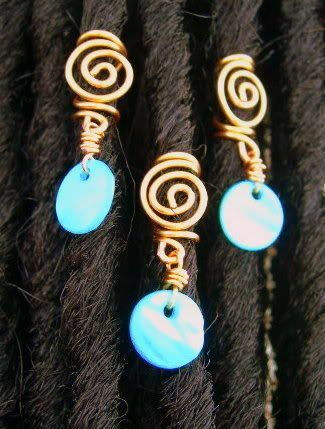 Loc charms- These are great for locs or braided styles. And there are so many options in the world! You’re guaranteed to find something you like. Just hop on Pinterest. What is your go-to hair accessory? And what’s a new one you’d like to add to your arsenal? Show us how creative you can be!